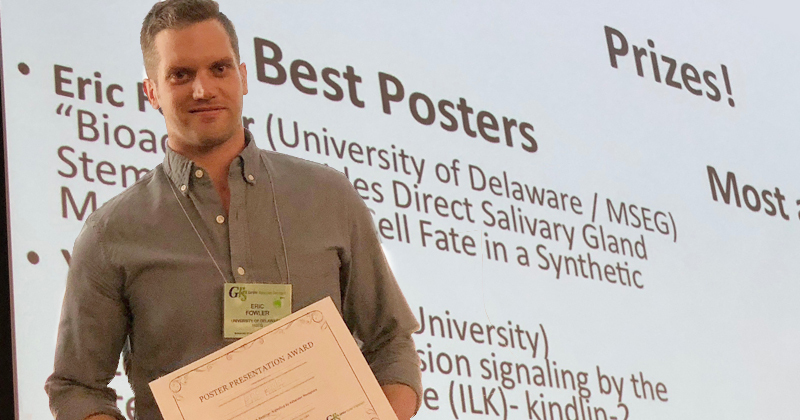 Materials science and engineering doctoral students Eric Fowler and Anitha Ravikrishnan received the Best Poster Award at the Gordon Research Seminar on Multi-Scale Adhesion Mechanics and Signaling, held on June 23 and 24, 2018. Their poster presentation, Bioactive Peptides Direct Salivary Gland Stem/Progenitor Cell Fate in a Synthetic Matrix, described a tissue engineering strategy under development to treat xerostomia, or dry mouth. Dry mouth is a symptom of radiation therapy for the treatment of head and neck cancers, which can irreversibly damage patients’ salivary glands. Dry mouth can make speaking, swallowing, and eating difficult. It can also promote cavities and other oral health problems. Researchers want to develop a functional, tissue-engineered salivary gland, but first they need to understand how salivary cells respond to the synthetic environments. The research team took human salivary/stem progenitor cells from patients before those patients underwent radiation therapy. Then, they cultured the cells in a custom-designed hydrogel containing peptide fragments of extracellular matrix proteins found in the native tissue. They found that certain peptide combinations direct the differentiation of these cells toward acinar phenotype, which secrete saliva; while other peptide signals make them more like ductal cells, which direct the flow of saliva. Fowler accepted the award at the conference.